Police and emergency service scanning is constantly changing. New equipment, updates to old equipment, rebanding and interference, professional conventions and other news of interest to the scanner world are available here and frequently updated. Whether news of the latest RadioShack, Whistler or Bearcat scanners ship date or general trade news, visit us frequently to stay up-to-date on all of the important scanner world information. Bentonville, AR (May 17, 2016) The Whistler Group, Inc., a leading industry supplier of state-of the-art mobile electronics, announced today a huge step forward in scanner technology with the addition of two new models to their scanner line up are the TRX-1 and TRX-2 featuring Digital Mobile Radio capabilities. Additionally, Whistler is announcing that development of NXDN monitoring is also underway and the TRX-1 and TRX-2 will include NXDN as a FREE upgrade when available. These models feature a full backlit alphanumeric keypad in addition to the easy-to-use Scan, Pause, Select and Navigation controls. All USA/Canada services and frequencies are pre-programmed onto the included SD card making the units ready to use out of the box - they can even be programmed by entering your ZIP code. We are extremely excited to add the TRX-1 and TRX-2 to our existing scanner line, said Leslie Folsom, EVP of Marketing & Operations at Whistler. When Whistler entered the scanner industry we were committed to bringing innovation and we are demonstrating that by our introduction of DMR and our development work on NXDN. As a further investment in their customers, Whistler will be offering a DMR update at no charge to customers owning models WS1080, WS1088, WS1095, and WS1098. This upgrade will be available via the EZ Scan pc app later this month. The TRX-1 and TRX-2 will begin shipping in late June 2016. MotoTRBO is a trademark of Motorola, Inc. Demonstrating our commitment to continually enhance the value and relevance of your investment in Uniden products, today we announce the latest upgrades for our flagship BCD436HP and BCD536HP scanners. Soon, owners of these scanners will be able to add the ability to monitor and scan Digital Mobile Radio (DMR) systems including MotoTRBO Connect Plus and MotoTRBO Capacity Plus systems with a single paid upgrade, making these scanners the indisputable best-in-class solution for monitoring radio systems. Until now, you've either needed to purchase a single-use radio to monitor these systems or kludge together a system using multiple radio dongles plugged into a PC. DMR is used extensively across the world by businesses, government agencies, amateur radio operators, and individuals worldwide. RadioReference.com, the premier web site for finding radio system information, has over 600 trunked DMR systems and over 4500 DMR conventional channels documented. But, this is just the beginning of the DMR story. The vast majority of DMR systems have never been documented since, up to now, users could not easily monitor them. Based on a quick survey of FCC records, we expect that there are tens- or even hundreds-of-thousands of additional DMR channels to discover. And discovery will be important. So, we'll include some basic tools for discovering DMR channels on your own so that you will be able to quickly supplement the information currently provided by RadioReference.com. We'll be adding details, below, as we get closer to finalizing the firmware release, so watch this space. We are working on putting the finishing touches on the upgrade but want to give you the opportunity to pre-order the upgrade so that you are ready to monitor DMR from the moment it is released. As a special thanks to early adopters, we are offering the upgrade for only $50 for a limited time. We'll let you know when the pre-ordering site is ready but, until then, save your spare change. Disclaimer: The above constitutes a pre-announement, which includes details as we know them today, but which might change based on technical, legal, economic, or other unforeseeable issues that could arise. No portion of this pre-announcement should be considered as a legally binding obligation to perform on Uniden's part. Coming soon December 2015 - Now, with the all-new SportSync SR-303 AM/FM Delay Radio, you can turn down the sound on your TV and watch the game while listening to your favorite radio announcers. Radio play-by-play announcers provide the most descriptive, interesting and fun calls of pro or college sports events. But radio signals almost always run several seconds ahead of TV broadcasts which must pass through cable, satellite or HDTV systems. Before, if you tried to listen on the radio and watch on TV, you heard each play called on the radio well in advance of the same action you saw on TV it took all the fun out of the game. Now, with the SportSync SR-303, you can delay the radio audio up to 16 seconds to exactly match what you're watching on TV. Our thoughts go out the family and friends of Phil Henry, who we lost this week. Phil was a great supporter of Uniden, bringing us innovative scanner technologies including Beartracker Warning System and Close Call RF Capture, and Location-Based Scanning on all of which he is a named inventor. He was also very active in with Leadership Challenge, LLC, and RESET Your Life, LLC, both of which present leadership training programs for such clients as the US Marine Corps and US Air Force JROTC Programs, and the Youth Offender Courts in Clark County, Nevada. We will miss his experience, his good humor, and most of all his friendship. Thank you to Paul and Uniden for posting this message about Phil Henry. Very few people in the scanner community knew Phil, but as Paul wrote he was instrumental in helping to bring advanced scanner technology to Uniden as part of a group of fellow engineers and scanner hobbyists. My partnership and friendship with Phil dates back to the mid-1980s. He was always full of life, adventure and positive thinking and he made everyone around him a better person because of it. My thoughts go out to his hundreds of friends and family including of course his wonderful wife Kathy. Scanner Master is extremely proud to announce that Rich Carlson, past-president of the Chicago Area Radio Monitors Association (CARMA) and one of the nation's leading scanner experts, is now part of our team. Rich recently retired as a Sergeant for the Winnetka, Illinois, Police Department and is now assisting Scanner Master customers in choosing the right scanner for their area, answering technical questions and helping us to develop new products and services. Rich is a highly respected member of the monitoring community who has decades of experience with all types of scanners and communications receivers, antennas, software and accessories. He has a great knowledge of the radio systems that we all monitor as he himself helped to institute and manage many in his time. We couldn't be more excited to have Rich on board. Our Pre orders for The BCD536HP will begin shipping on Friday January 24th. They will ship in same order as received(first ordered first shipped). Our Pre orders for The BCD436HP will begin shipping on Thursday, January 30th. They will ship in same order as received(first ordered first shipped). If you ordered programming please allow 10 - 15 business days for this. You may cancel the programming if you do not wish to wait by emailing us. We will not be attending the Dayton Hamvention this year, only the 2nd time in about the last 15 years. We will be back next year though. The Massachusetts State Police have started the "Rebanding" process for their towers on Cape Cod for the statewide trunking radio system . Some of you may be asking what is Rebanding? The 800MHz band is shared by both NEXTEL/cellular and public safety communications. For over a decade now there have been problems with interference. To eliminate the interference, all public safety systems operating between 865-869MHz will "reband" to 851-854MHz and join with other public safety frequencies operating from 851-861 MHz. This will form a buffer between the public safety and cellular frequencies rather than being intermingled as they are today. We had set aside some time ago 10 brand-spanking new PSR-400 analog trunking desktop scanners. These are the very easy to program models which GRE discontinued over a year ago and replaced them with the PSR-410's which used object oriented programming. Now all the 410's are gone but we are selling off these 10 PSR-400s for $299.95 each. There isn't even anything comparable to them in the Uniden line. First come, first served on these 10. This short video introduces the major new enhancements in the HomePatrol-1 Extreme Firmware and HomePatrol Sentinel releases. See us at the Dayton Hamvention! This week Rich Barnett of Scanner Master along with Gommert Buysen of Butel Software will be at booth #402 inside the Hara Arena Complex at the Dayton Hamvention in Dayton, OH. The Hamvention is the world's largest Amateur Radio convention and Scanner Master will be there demonstrating and selling scanners and accessories for the scanner community that attends each year. If you're a fan of scanners please stop by and say hello. The GRE PSR-310 portable and GRE PSR-410 base/mobile analog trunking scanners are now only $174.95 each. This is an amazing price for two extremely capable radios. GRE has confirmed that it's new PSR-800 pre-programmed digital scanner will decode both APCO-25 digital AND X2-TDMA which is an early variation of APCO-25 Phase II TDMA digital. This is very exciting and important news in the scanner world. Currently X2-TDMA is used by select public safety agencies in the Washington D.C. area, particularly in Prince Georges County, MD. Up until now no scanner could decode TDMA. X2-TDMA is not the final spec of APCO-25 Phase II but we believe it will likely be quite some time before the final specifications are announced and equipment is manufactured. Thus the PSR-800 will not be able to decode a future unknown specification. In the meantime though, for people in the DC area and possibly other areas in the future, the PSR-800 for now is the scanner of choice. GRE's pre-programmed PSR-800 is now available in limited quantities. With a great size and form factor, too. This scanner is pre-programmed for the U.S. and Canada and contains 200 scan lists that you can access. Simply select the state, county, cities and agencies you wish to monitor and go. Visit the PSR-800 product page for more information and to order. Boost audio and reception of your portable scanners with our new SpectrumForce Lapel Speakers with Antenna Mount. These speakers look just like the speaker microphones used by law enforcement, EMS and fire service personnel but of course these are speakers only. But they have a couple of great new functions. First, they bring the audio from your portable scanner right up close to your ear while you keep the portable scanner on your belt and with a unique twist it boosts the audio from everyday speakers for most scanners on the market.Secondly, the product also elevates your portable scanner antenna up by your shoulder and away from your body providing an improvement in reception. Available for SMA and BNC antenna-jack portable scanners. See photos and more details now. RadioShack has just released its all new PRO-107 iScan radio. This trunking (non-digital) scanner is the first of its type to have the look and feel of an mp3 player or even the Apple iPhone. No longer do you need to program it. You simply select from a list your state, county and city and of course you can choose multiple cities/regions to monitor. The radio runs on two AA batteries and will fit in a shirt pocket. This is an outstanding choice for novices and those who don't wish to "play" with the scanner, but rather just listen. Garmin GPS Receiver in Stock! We now have available specialized Garmin GPS receivers that work superbly with the Uniden scanners which are GPS-controllable. These are high-quality Garmin receivers that rapidly access the satellites and transmit position data back to the scanner. Scanners such as the BCT15, BCD996T, BCD396XT and BC346XT can use that data to automatically enable and disable systems (and groups) based on the user's location. Note that the Garmin includes a DB-9 connector which attaches to the back of the base/mobile scanners but does not connect to the portables. You will need to use your existing serial cable that comes in the box with the scanner along with adapters that are available separately. Boston -- NBC Network News Field Operations has selected Scanner Master Corp. as its sole provider of scanning radios and scanner programming for its Vortex-2 support team. As part owners of the Weather Channel, NBC is providing equipment and field logistics to the Weather Channel crew on the five week Vortex-2 mission. Vortex-2 is the largest "tornado chase" ever, with over 100 engineers, scientists and support personnel working together to locate and analyze tornadoes in an effort to improve their understanding and ability to predict these natural monsters. NBC and other Vortex 2 team members employ multiple police scanners in their trucks and in their equipment bags in order to keep track of how public safety agencies are handling weather emergencies out in the field. By learning of road closures, storm damage, listening for siren activations, and monitoring storm spotter channels, reporters, producers, engineers and scientists will have another tool in their arsenal to help predict where severe weather is occurring and to stay as safe as possible at the same time. Kevin Parrish, Senior RF Engineer for NBC Network News Field Operations said, "We chose Scanner Master both for their high-level of expertise and service and also for their unmatched ability to program scanners in an extremely comprehensive way. We required programming of conventional, digital, trunking and multi-site systems covering thousands of square miles in the midwest, including GPS coordinates which are so useful on Uniden scanners. On short notice Scanner Master did an incredible job of programming and it's helping us perform our jobs more efficiently." Scanner Master has provided scanners, software, antennas and custom monitoring solutions for the news media for over a decade. In conjunction with Butel Software, Scanner Master has created ScannerStation, an assignment desk local and remote monitoring software package for news media that is used nationally by ABC, CBS, Fox and others. New England Law Enforcement Expo. 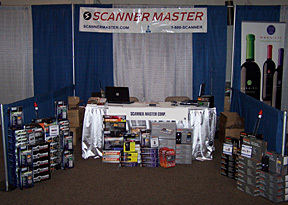 Scanner Master displayed its full scanner and accessory line at the first New England Law Enforcement Expo on May 12-13th in Sturbridge, MA. You can read more about the Expo at www.nelawenforcementexpo.com. Manning the booth were Molly Olive, Scanner Master Marketing Coordinator, and Jonathan Higgins, one of our top scanner experts. Uniden America Corporation in late March released two new high-end portable scanners into the marketplace: The Bearcat BC346XT analog portable and the Bearcat BCD396XT digital handheld scanner. Both scanners utilize the same "396/330" case used by older models, but inside there's a world of difference from their predecessor scanners. The 346XT replaces the beloved Bearcat 246T. The new version has a far more advanced and informative display, more memory, and a load of other new features. The BCD396XT jumps in memory from 6,000 to 25,000 memory locations (so more than you'll ever need), has significantly improved digital voice decoding quality, and also a host of new great features. Both models are re-banding-ready for updated Motorola trunking systems. These are VERY impressive upgrades. Well done Uniden! Click here for more information on the BC346XT . Click here for more information on the BCD396XT . New frequencies & firmware required. The city of Nashua Motorola trunking radio system has just re-banded. They are now operating on a new set of 800 MHz frequencies for their mixed digital and analog trunking system that is used by the police and fire departments as well as just about all city services. The only way you can listen to Nashua now is to either buy a new scanner (if you only had old models) or upgrade the firmware in newer models. See the Uniden.com or the GREAmerica.com web site for further information on re-banding firmware for downloading. Also see this excellent page for further information. Scanner Master is pleased announce the hiring of its newest Customer Service Rep, Greg Jolly. Greg is a Massachusetts firefighter and also a part-time fire dispatcher. He's also been an avid scanner hobbyist for decades and is familiar with all the major brands. Greg will be working at Scanner Master when he's not at the station helping to generate content for the Scanner Master web sites and also working with our customers helping them to make the best scanner choice for their area. As an active public safety official and a radio enthusiast, Greg is perfectly suited to assist Scanner Master customers in listening to their local police and fire departments. 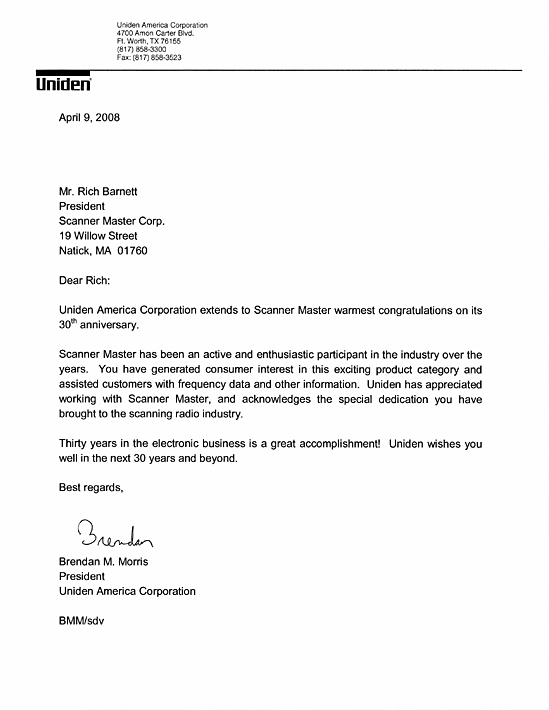 Scanner Master Corporation today completed its purchase of Uniden America's remaining stock of the BR-330 scanner and the RH-96 Remote Head kit. This large purchase ensures that Scanner Master customers will have access to two exciting products that will no longer be manufactured. The BR-330 is the only trunking scanner that has ever been manufactured which includes the 500 KHz to 25 MHz AM Broadcast, 20-40-80 Meter Amateur Radio Bands and the Shortwave Broadcasting bands. The scanner is also unique in that it covers the entire TV audio spectrum which includes wireless microphones. (TV audio itself will soon go away as part of the move to digital TV.) This is a very unique wideband scanner that Scanner Master is proud to carry. The scanner is also re-bandable. The RH-96 allows users of the BCT-15, BCD996T base/mobile scanners and the BR-330 and BCD396T portable scanners to operate their radios in a vehicle with a small "head" unit. A ten foot cable connects the head unit to one of the above-listed scanners which can mounted under a seat or in a trunk. This handsome, easily-mounted, remote head is perfect for those who want an attractive installation that takes up little room in the front cab area of a car or truck. We'll be showing and selling all the Uniden and GRE scanners, BuTel Software, our full line of accessories, and our all new Scanner Master Massachusetts, Rhode Island and Southern New Hampshire Pocket Guide - 11th Edition. This book makes a great gift. The 2009 Scanner Master Catalog Has Arrived! Our 9 page 2009 catalog is now at our warehouse. You may view and/or print out the PDF version right now from our website on our Catalog Page. If you would like a free copy mailed to you simply send and email to catalog@scannermaster.com and include your Name and full mailing address. We will mail you a catalog and add you to our mailing list. The catalog has a full listing of all our products. ScanNewEngland.net, a leading resource for local frequencies, user forums and live feeds within the region, and Scanner Master, the nation's oldest and largest scanner-only dealer, finalized a marketing agreement earlier this month. As a result of this affiliation, Scanner Master's extensive line of scanners, software, antennas, and accessories will now be available to purchase through ScanNewEngland.net. By purchasing scanner products through the Scanner Master links on their website, ScanNewEngland.com will receive commission on all sales that they generate. This affiliation will allow for a new approach for New England radio hobbyists and professionals to give back and help grow one of their favorite, frequently visited websites, as well as enhance the business of a local company that has been dedicated to scanner products and services for the last 30 years. Scott Halligan of ScanNewEngland.net stated, "It is my pleasure to get on board with Scanner Master. They are a local business, long established in the hobby, and a leader in the sale of scanners, accessories, and some truly unique devices. I look forward to working with the company, and from the comments received thus far from many Scan New England members, so do they." Rich Barnett of Scanner Master remarked, "Scott Halligan has provided the scanner hobbyists and professionals a superior regional resource for years, starting with his ScanCapeCod site. Now, with Scannewengland.com, Scott is extending his efforts throughout the six state area and we are very proud to serve as his affiliate scanner dealer." After undergoing major expansion, ScanNewEngland.net now serves as a platform for the frequency data of six states, offering radio hobbyists and professionals a publicly accessible discussion forum, New England frequency database, and New English Scanner Feeds Teamspeak Server. Serving the radio community for over 30 year, Scanner Master has prided themselves on their informative service and extensive knowledge of scanners, accessories, programming, and other custom products. Richard Barnett, president of Scanner Master, just returned from the Hong Kong Electronics Show where he met with the developers of a new line of antennas and speakers the company is developing for scanner hobbyists and professionals. The first antenna should be available later this year. It has been reported that the SLC area has re-banded. Only recent TrunkTracking scanners are capable of re-banding using firmware downloads from the scanner manufacturers which are or are soon expected to be available on their web sites. For older model scanners, such as the BC895, BC780, BC235, PRO91, PRO2066 and others, you will need a new scanner. These and other older models cannot be upgraded. Check the manufacturer web sites for further details. Re-banding will affect Motorola 800 MHz trunked radio systems across the country. RadioReference.com and Scanner Master Corp. Renew and Extend their Partnership. RadioReference.com, the Web's premier resource for radio communications information, and Scanner Master, the nation's oldest and largest Scanner-only dealer, today announced the renewal and extension of their joint-marketing partnership. Through this partnership, the most comprehensive line of scanners, software, antennas and communications-monitoring accessories, sourced from around the world, are offered to the world's largest online community of two-way radio users. RadioReference is also developing exciting new products services which will be marketed through Scanner Master starting later year. Richard Barnett, president of Scanner Master Corp., remarked, "Our partnership with RadioReference.com is our most important. It allows us to present scanners and accessories to an enormous audience of dedicated radio professionals and hobbyists. Through this relationship, we strive to provide unmatched service and a wide product mix to the RadioReference.com audience through our strict focus on scanners and scanner users. Lindsay Blanton, president of RadioReference.com LLC, said, "Scanner Master is widely recognized in the radio communications community as the leading provider of scanners and communications equipment to the industry. This, coupled with their leadership in innovating new products and offerings for the industry means that this partnership will continue to grow and be very successful." With its extensive frequency and trunking databases, news sections and user forums, RadioReference.com is the one-stop repository of radio communication information. For over 30 years Scanner Master has served the radio community through its line of popular Scanner Master and Monitor America books as well as through the sales and service of scanners, accessories, software, antennas and other custom products. Scanner Master has hired Molly Olive, our new Marketing Coordinator. Molly, a recent graduate from the University of Vermont, will be exploring new marketing opportunities, promoting new products, and she'll be working with new public safety, news media, insurance and commercial accounts. Meet Molly and the rest of our staff. The founder and original editor of Police Call, Gene Hughes Costin passed away recently. Gene was instrumental in the growth of the scanning hobby by providing critical frequency information through his Police Call guides which were sold for decades through Radio Shack and other stores. In later years Scanner Master president Rich Barnett joined forces with Gene and became the book's editor. Gene was a wonderful business partner and friend and he will be sorely missed by the entire scanner community, Barnett said. Our customers requested it and we now accept it. Google Checkout is a fast, secure way to buy from stores across the web. When it's time to buy, look for the button. Use it once and stop creating new accounts every time you buy. SSE of England, owned by Jim Finch of the well-known and highly-regarded "Jim" brand of radio accessories, has selected Scanner Master as its North American Master Distributor for its line of RF/Communications products. These SSE productsinclude notch filters, antenna switches and diplexers, a UHF military and commercial airband portable rubber-duck antennas, a very unique adjustable audio filter, and more. All these SSE/Jim products provide the monitoring hobbyist and professional with the highest quality design and components. Scanner Master is proud to offer the SSE/Jim line through its North American dealers and direct to its customers. Scanning in Europe is a huge hobby and to supplement the scanning experience there hobbyists have flocked to the AirNav Radar Box which allows you to follow the flights, in real time, of commercial aircraft from around the world. It's like having an Air Traffic Control radar screen on your PC. In the U.S. the system now only tracks international flights, but U.S. flights are coming soon. However, through your web connection, you can follow national and international flights around the world! And combined with a scanner it's amazing fun. See the AirNav Radar Boxon our site. Richard Barnett, President of Scanner Master, traveled to Tokyo and Taipei this June to meet with scanner and antenna manufacturers seeking to expand its lines to offer you the best product on the market. Scanner Master has hired Jonathan as one of its Customer Service Reps/Scanner Experts. Jonathan has been an avid scanner user for many years. His in extensive experience and knowledge greatly compliment our current staff of scanner experts. Meet Jonathan and the rest of our Staff. 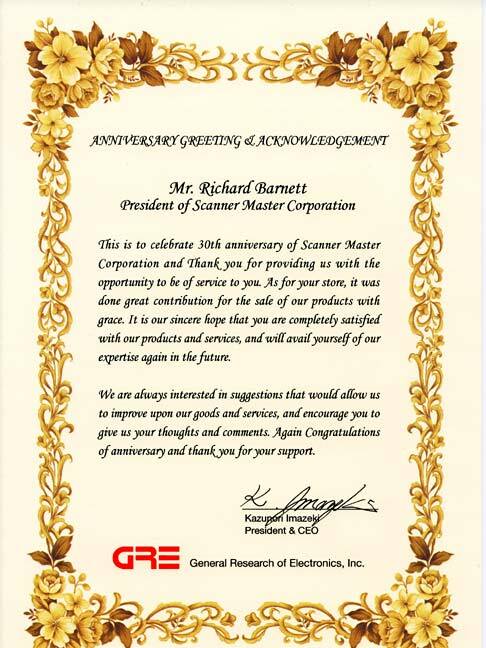 The world's major scanner manufacturers all send in their congratulations to Scanner Master on our 30 years of service in the scanner industry. Click on the links to see. Uniden-Bearcat letter . GRE letter . 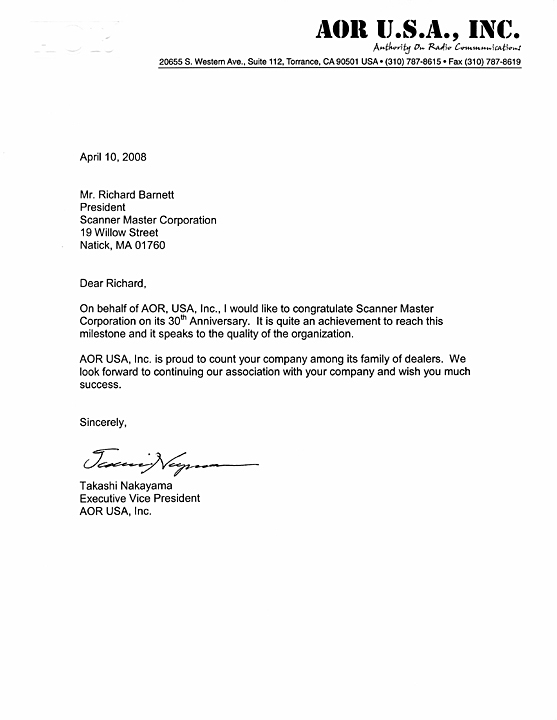 AOR letter . Rich Barnett, president of Scanner Master, met with Uniden's scanner product manager at Uniden's booth at the 2008 Consumer Electronics Show this past Wednesday in Las Vegas. Uniden was not showing any new scanners but the two discussed the healthy state of the scanner market and how dealers could better serve their scanner customers going into the future. Paul Opitz has been involved in scanner development for many years, going back to his years at Radio Shack, and is one of the nation's experts on scanner technology. Scanner Master is now an authorized GRE "GRECOM" Scanner Dealer! Scanner Master has been named one of GRE Radio's Authorized Scanner Dealers, able to sell GRE's new line of scanner radios exclusively designed for the U.S. market. GRE has sold scanners in Europe for years under their own brand name but is just now entering the U.S. market for the first time under the GRE banner. For years GRE has been developing and manufacturing scanners for Radio Shack with approximately half their PRO series scanner line. Some of the famous and highly regarded GRE scanners that were built for Radio Shack include the great PRO-2004, 2005 and 2006 scanners as well as more recently the PRO-96, 97 and 2096. The PRO-96 and PRO-2096 are Radio Shack's digital models that are well known in the industry for their superior digital voice quality. GRE now enters the U.S. market under their own brand name and Scanner Master is proud to offer these great scanner radios for sale starting in late October '07. The largest distributor of scanner and related radio products in the United Kingdom, Waters & Stanton, has named Scanner Master its exclusive North American distributor. Scanner Master is now importing, distributing and selling Waters & Stanton's superior line of scanner antennas, pre-amplifiers, mounting devices, speakers and related products. These are completely unique and extremely valuable accessories which are available now in the U.S. through Scannermaster.com. These accessories are also available at wholesale prices for retailers interested in also selling the gear. For more information contact Rich Barnett at 1-800-SCANNER.